"The famous multi-purpose vehicle". 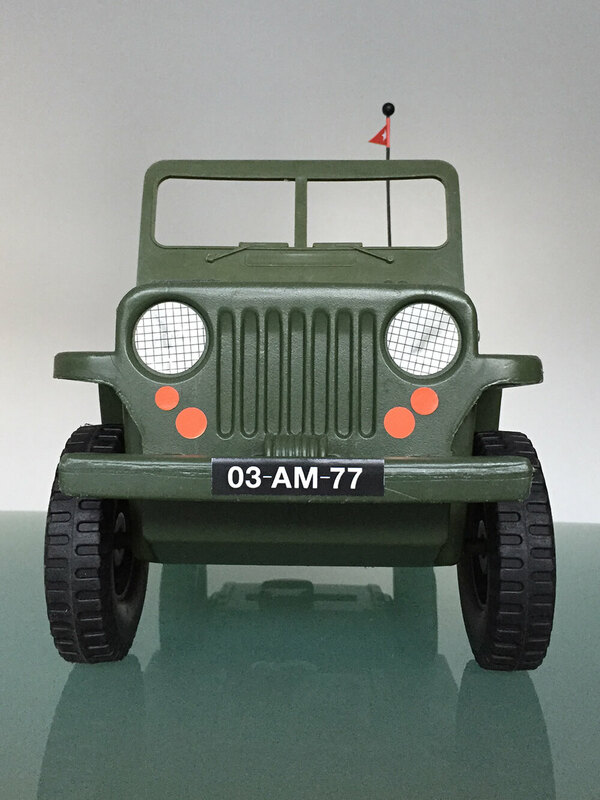 This late 1970s	version	of	the all-new blow molded jeep was produced with stickers with the allied white star on bonnet. 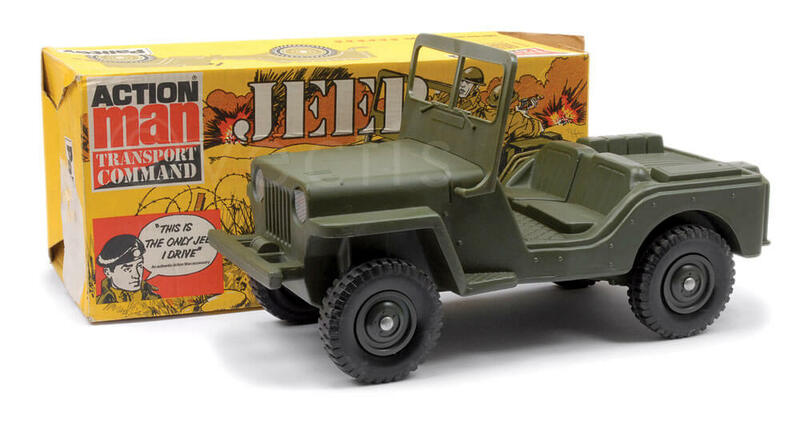 It was a tough, simple jeep had a tilting windscreen and had with lots of play-value. 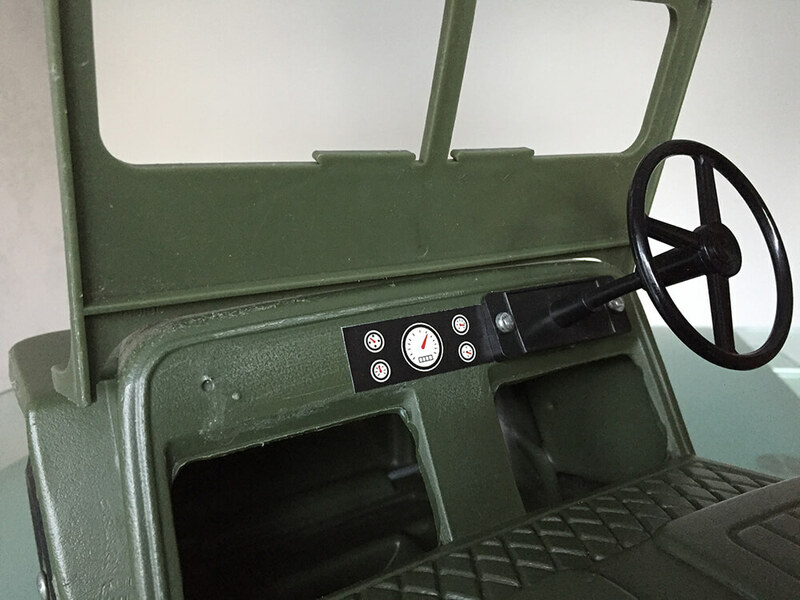 The Pailitoy UK version was right hand drive, but provision to switch this for other markets is obvious from studying the dashboard. 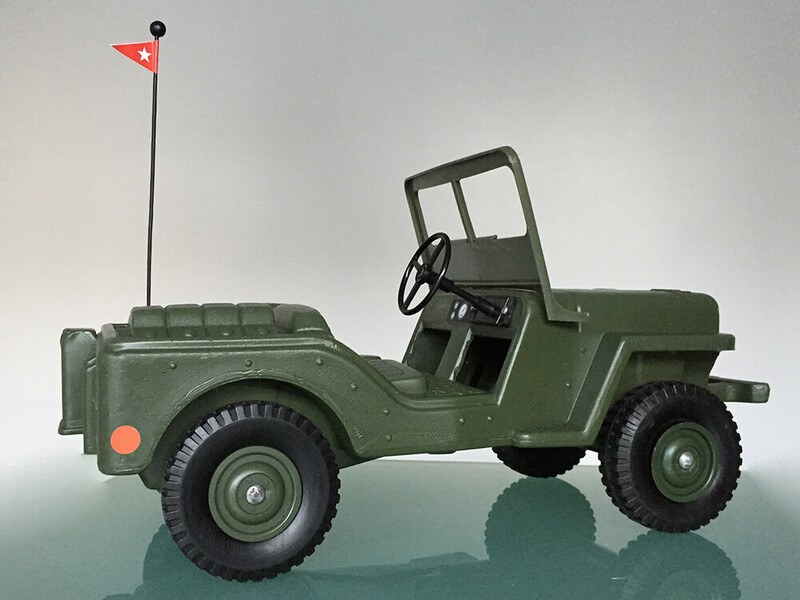 An 'Infantry Support' Jeep followed in the next year with a totally different body with opening bonnet, large artillery gun in the back and different stickers. 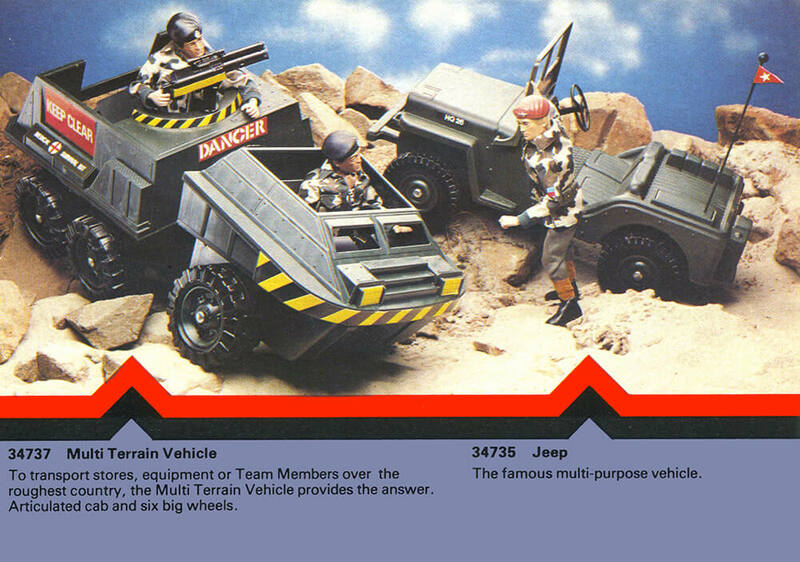 In the 1981 an 'Armoured Jeep' based on this same blow molded jeep was launched with twin dash mounted machine guns, netting, a few jerry cans and other accessories but notably with no windscreen. 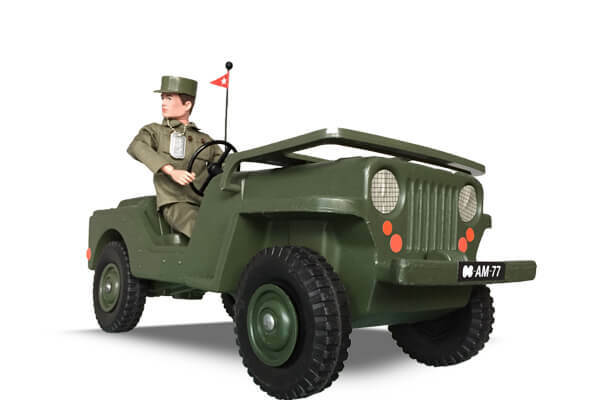 A blow molded Action Man Jeep first appears in the 1969 Equipment Manual with a more pinched nose and convex headlamps. 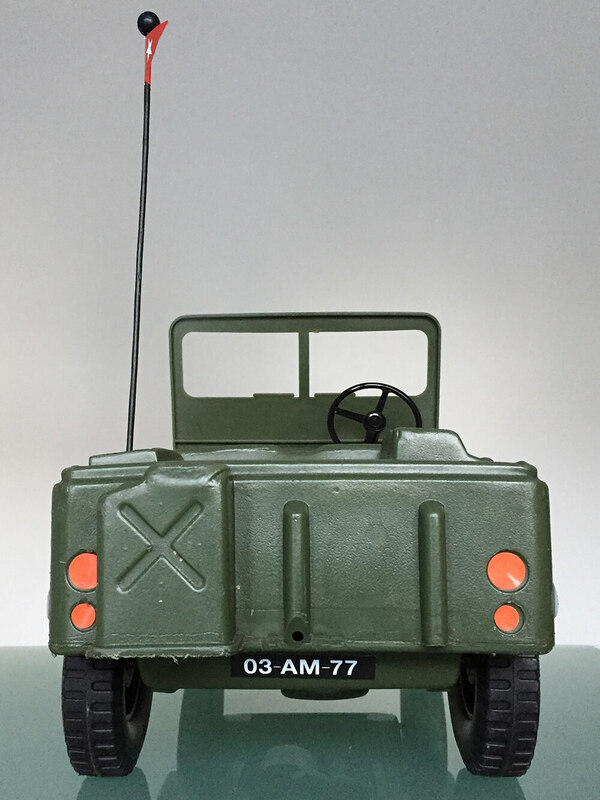 This all-new version for 1978 has a stronger windshield, recessed headlamps (with stickers) but still suffers from issues with the one vulnerable part - the steering wheel breaking at the spokes or being going missing. Other than this it is a fairly robust toy, unlike the fragile Landrover from which it took over. From the letters on the number plate (03-AM-77) , its likely that the sticker sheet was on the drawing board during 1977. The black plastic whip aerial with end ball is often missing and the one in the image has been recreated to the same dimensions. 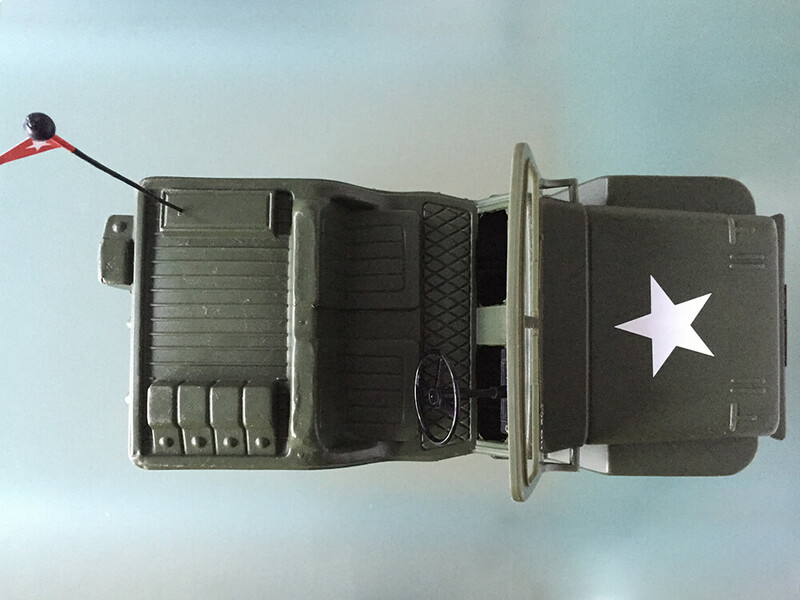 The dashboard and number plate stickers are an accurate reproduction, but the headlamps (on silver metallic print), star and repeater lamps are original. 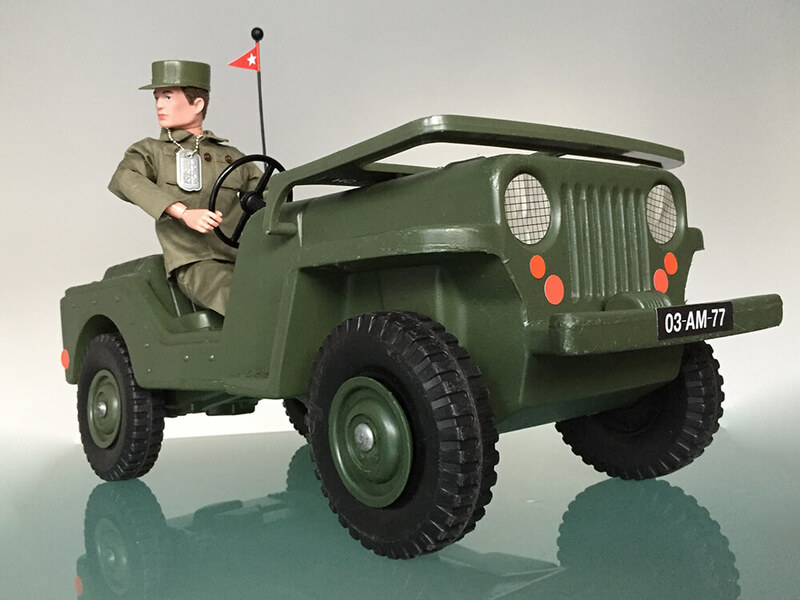 The later Armoured Jeep would use the same steering column mount, affixed forward of the passenger to mount the twin machine guns. 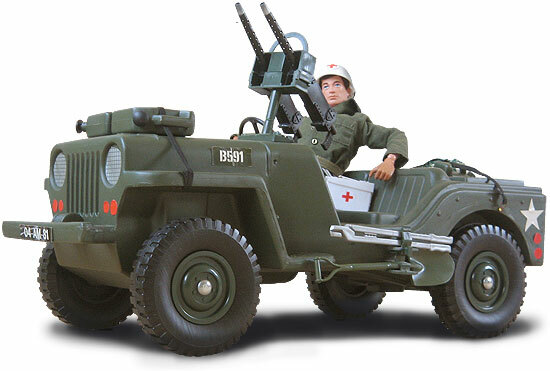 An Infantry Support Jeep was also produced. 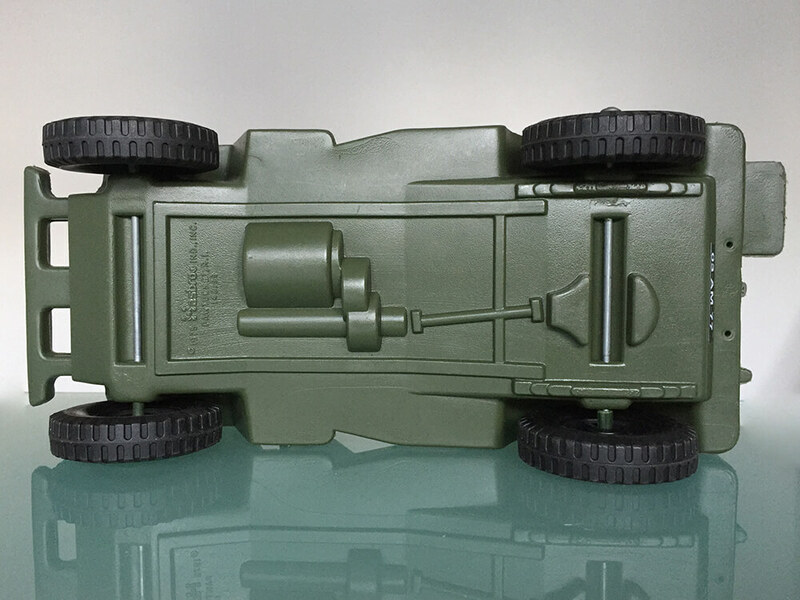 Action Man 'Armoured' Jeep of 1981 - note additions. 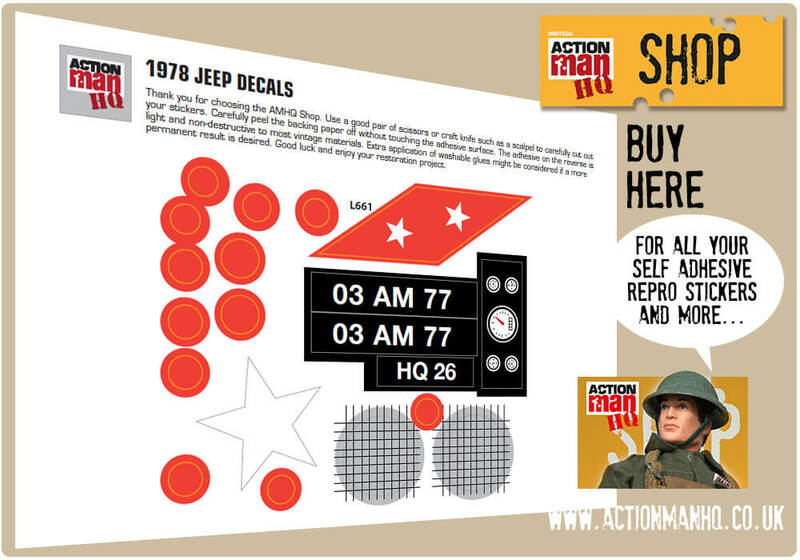 Action Man Jeep repro stickers. 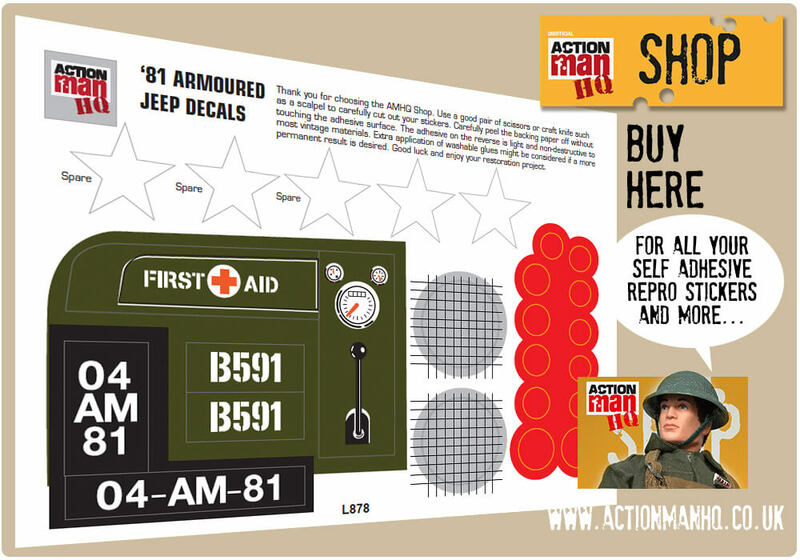 Action Man 'Armoured' Jeep repro stickers. 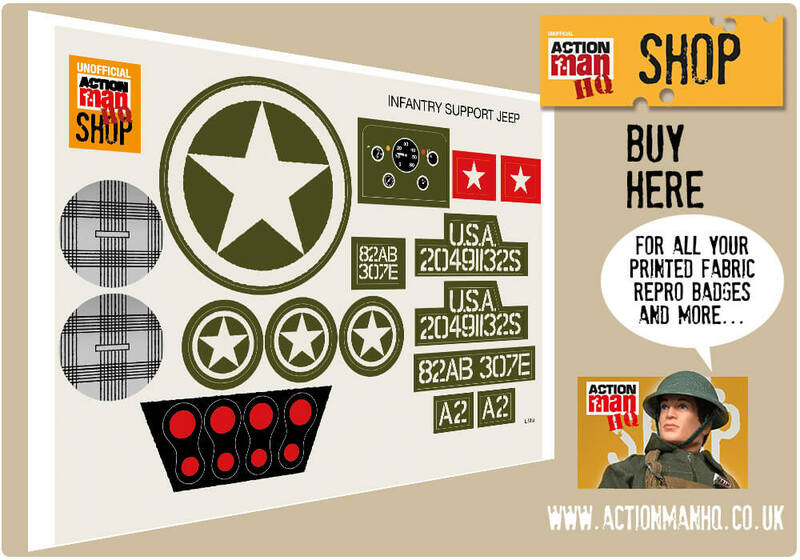 Action Man 'Infantry Support' Jeep repro stickers.